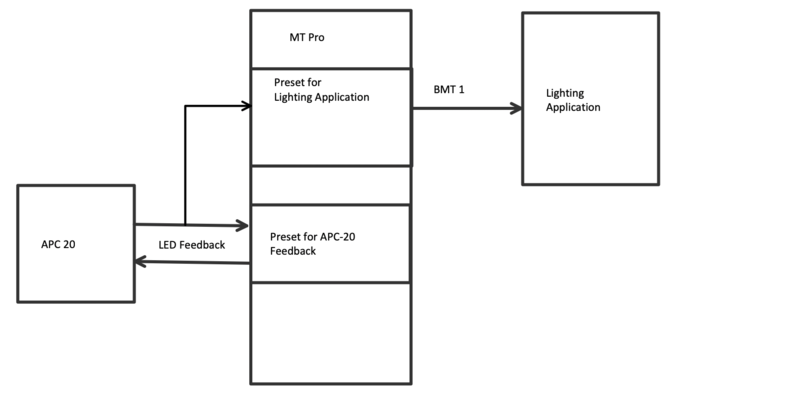 Please see the below diagram for how to handled APC20 LED Feedback if your application does not provide the feedback that you wish. Basically, you define all inputs and outputs at the project level. This will be all inputs and outputs that you will use. Then you set up 2 presets to override the project defaults. The first preset you define output for your application (in this example a lighting application). When you define different inputs and outputs at the preset level, it will override the inputs and outputs at the project level. Under each preset you put the translators and what you want them to do for the target output. Typically, some of the pads you want to toggle and others you do not going back to the APC20 on its preset and many lighting applications just trigger on notes-on messages. The APC20 has 4 different operating modes and starts in Mode 0. In this mode several buttons are toggle already and you cannot otherwise manipulate them with the host (or MT Pro). For my APC40-MK2 I usually go to Mode2 which allows me to completely control the LED’s with MT Pro. With this I set up an initialization sequence (Sysex Message) at startup to my controller to put it in the Mode I want. Here is what I recommend for Mode 1 for output Sysex to APC20. The below numbers are all in hexadecimal. Use a different number than 41 if you want to switch to a different mode. So if you want to make buttons toggle you do this (the simple way with one global variable per button). In this example I do not transpose any channels. // colors to the controller. This will toggle ga to 1 or 0 with the exclusive OR bitwise operator. But you can then use the velocity to determine the color you return back to your APC20. You would need a different global variable for each button. There is a way to use a single global variable (which is 32 bits) to control 32 different LED’s but it is beyond the scope of this discussion. You should be able to find my post on “bitmapping” by searching this forum. If I remember I put an example out there that toggled all 64 of the main APC-MINI LED’s with just 2 32 bit global variables. You shouldn’t have to worry about the number of global variables available except for very large projects. There are 360 global variables available for use. See section 10.3.2 of the user manual for their naming conventions. You can press F1 inside of Bome MIDI Translator Pro to pull up the user manual. To return back the velocity to the APC20, do I need to select it as MIDI OUT in addition to having the Bome Virtual Out selected? (This is NOT referring to the routing but the Outgoing section –> Select MIDI ports). Also, I’m assuming I will need translators for each button as well then? I think I actually already allow the default midi message to pass thru anyway. 3) You should probably create something to turn off any existing playing notes when you release note 8 (shift function). Otherwise, the playing note will get stuck on because when you release the shift and then the note, the note-off will pass through on the incoming channel. For number 3, I usually would send either an all-notes-off CC message (if your controller supports it), or use a timer to iterate through all notes on the shifted channel turning them all off just in case one was playing when you released shift. (which is another discussion I can help you with if you would like). Default message passes through only if you have a MIDI thru path defined in MIDI routing section or you have another translator handling it. The default thru path will still pass through the incoming action. Very cool, thank you so much. I will give it a shot and get back to you! Steve, it seems when I change the note ON channel and construct my outgoing raw midi message, it is actually changing the message type to a control change when it reaches the application I am using to read it. Have you seen this problem before? Ah, you are using Raw MIDI output instead of note so you will need to assemble your control byte. The upper nibble is the command 0x90 for note-on. The lower half is the channel 0x0n for channel where channel is n.
Which is an bitwise OR function. Yes but the local variable will not remember its last value on the next iteration of firing. In the above any note coming on MIDI CH1 will go out on MIDI CH2. If it came in on MIDI CH2 it would go out on MIDI CH3 etc. Be careful not to send on MIDI CH 16. I suppose since the outgoing is a 7 bit value it would go out out on MIDI CH1 but I’m not sure. Also notice that if you pp is MIDI CH1 the value of pp is 0 since MIDI Channels start with 0. Now if you want to increment the MIDI CH each time, then it gets more complex and would involve a global variable. Let me know if that is what you want to do and I can give you an example there.